Jon Favreau has become one of those directors you can't overlook. He's been in the industry for years as both a respected actor, producer and director. He was on the ground floor of the super hero monster that's taken over cinema of late, having directed the first Iron Man film (by far the best Iron Man film so far). By now, it would be surprising if he couldn't make just about anything he wants. 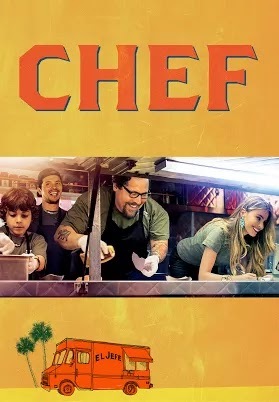 In Chef, a film he wrote, directed, produced, and starred in, he plays Chef Carl Casper, the head chef at a Los Angeles Bistro run by a power hungry owner named Riva (Dustin Hoffman). When the biggest food critic in LA comes to the restaurant, Riva demands Carl cook their normal menu rather than letting him try interesting new dishes. The result is a bad review with more than enough libelous statements directed at Carl personally to send him over the edge. Much like Frank, another 2014 film that used social networking effectively, Twitter plays a significant role in the film. Carl is comically unfamiliar with social networking and has his son Percy (Emjay Anthony) setup twitter for him. The interaction is one of the first real moments father and son get to have together. However, Carl is still unfamiliar with what Twitter really is, and accidentally, publicly posts a nasty reply to the critic's review (which had gone viral via Twitter). After a bit of a back and forth between the two, Carl challenges the critic to return for another meal, promising it would be different this time. However, Riva still won't let him cook what he wants so he quits. He also has a confrontation with the food critic that winds up going viral on Twitter. It's all enough to ensure that his job with Riva's restaurant is gone for good. Carl, now adrift with no ideas for jobs tries to spend some more time with Percy. Percy had been constantly disappointed in the neglect from his father. Carl's ex-wife, Inez (Sofia Vergara), maintains a friendly relationship with Carl, and offers to take him with Percy and herself on a trip to Miami. She had seen for some time that he wasn't happy working at the restaurant. She knew he was not allowed to be creative or experiment while working for Riva. So she offers to setup a meeting with another of her ex-husbands who could get him a food truck where he can make his own menu and be his own boss. After a comically awkward scene with the other ex-husband, Marvin (played by Favreau's Iron Man friend Robert Downey Jr.), Carl is given an old food truck. Eventually his loyal friend from the restaurant, Martin (John Leguizamo), joins him in this new venture. Having received the truck in Miami, they have to take it on a road trip back to LA. It becomes a chance to bond with his son. They stop in cities to sell food all along the way, and Carl teaches Percy everything he knows about working in a kitchen. Percy's constant Twitter updates along the way serves as their marketing campaign ensuring there is a lengthy line awaiting them at every stop. It's a story about good people who deal will tough times. Hollywood has a tendency to over caricaturize people turning good characters into saints, and bad characters into complete villains. In stage plays it's common for actors to over emphasize emotions so they'll be seen and heard from the back row. The film equivalent is going too far with characterization. Favreau doesn't make that mistake. He keeps most of the characters believable. It's a slice of life film, that doesn't go for the normal Hollywood archetypes or even the normal three act structure. While I like slice of life films like this, most would tell you that Favreau's different style here creates a problem. There just really isn't much conflict. As such, the film feels like it's missing something. Instead of making things hard for the main character to achieve or breaking up a relationship before bringing them back together again in the final act, every relationship is pretty strong to begin with. Every situation comes easy. While Carl deals with a tough time, he also doesn't have to overcome anything to achieve his goal. I should also say, Inez (Sofia Vergara's character) was underdeveloped. We can hardly even tell what she does for a living, let alone the state of her relationship with Percy and Carl. There is a hint that maybe Carl and Inez have another shot, but they don't really make anything of it. The heart of the story here is the father son relationship, and the scenes with them together are among the films best. The dialogue always feels natural as if it's being ad-libbed. The performances are also strong, particularly that of Jon Favreau. There's also metaphor to be had here. Favreau, the writer, director and producer, modeled the film on his career in Hollywood. You work hard, you love your craft, and you want to be inventive and creative, but Hollywood knows what it wants, and what it thinks audiences want. The people who pay for films sometimes have a constraining relationship with those trying to tell the story. Favreau wouldn't be the first director to complain about the "Hollywood system." He's more than familiar with it, having directed big budget Hollywood films like, Iron Man, Iron Man 2, and Cowboys & Aliens. His scene in which he yells at the food critic feels like a scene many filmmakers would like to play out in real life with film critics. He screams at him, "It hurts!" It's his livelihood, it's his passion. He works hard, and in a couple of paragraphs seen by millions, his hard work can be torn down. In a way as the film turns travelogue for the final act, it starts to resemble a program you might see on Travel Channel. Much of these scenes involve buying ingredients and food preparation, all of which reminded me of the many food oriented shows (as someone who has spent more than their fair share of time watching Travel Channel). I'm actually somewhat surprised they don't have a reality program involving a touring food truck (unless I've just missed it). Chef Roy Choi, who's credited with creating the food truck movement, was around to train Favreau to cook and give the food preparation an authenticity it would have lacked otherwise. 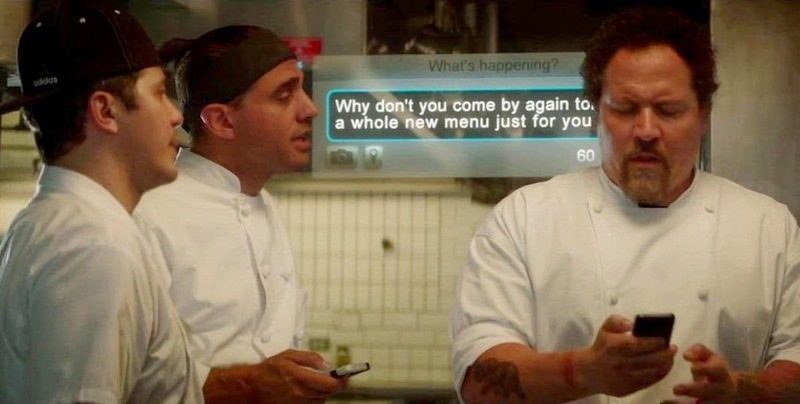 Chef is an entertaining, light-hearted, and funny film that has a lot of merit, even if it isn't a perfect film. 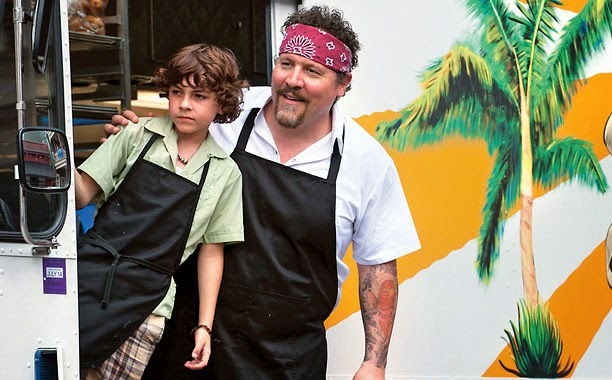 If Favreau wants to get away from Hollywood, and make more smaller, more personal films (or produce the aforementioned show on Travel Channel), I'll be excited to see what he does next.